Today I gave a talk on sentiment and semantics in visual text analytics at CANVAS 2014, the Canadian Visual Analytics Summer School. The summer school gathers together graduate students, academic, and industry researchers in visual analytics from across Canada. There have been many great talks which are going to be archived online. My talk today introduced students to the language technologies we most often use in the lab, including NLTK. I also discussed our work on visualizing semantics and sentiment in various research projects, as well as highlighting some great research by other people. Check out the slides! We have just launched a new visualization of emotion as expressed on Twitter. Visitors to SentimentState can use the tool to explore the overall positive/negative score of tweets for a selected user over time. Filters allow for analysis of various emotions such as surprise, disgust, and joy, as expressed in the NRC’s emotion lexicon graciously provided by Saif Mohammad. Try it now with your own account to reveal how your emotions are expressed in Twitter over time! We are interested in feedback on this project – email christopher.collins@uoit.ca with your comments. We hope to expand the search to allow views based on hashtags and geolocations. Congratulations to Wesley Taylor for the best raytracing project for CSCI 3090 for Winter 2014. Wesley’s rendering includes the basic requirements, plus reflection, refraction, soft shadows, and a series of complex geometries. Furthermore, Wesley created a parallelized implementation and ran the rendering on a high-performance computing system to generate a 4K image for his final submission. Well done! The Honourable Ed Holder, Minister of State (Science and Technology) recently announced that I will be the new Canada Research Chair in Linguistic Information Visualization at UOIT. I am very excited to begin this new role, and grateful for the significant investment of both UOIT and the Government of Canada through NSERC. The planned research, on new ways to interact with, manage, analyze, and explore the barrage of linguistic data produced daily has a high probability of economic impact and social interest. I look forward to working with great students, as well as local and international academic and industrial partners as I pursue solutions to pressing information visualization and human-computer interaction research challenges. See also: UOIT’s announcement about the Chair, and more information about the Canada Research Chairs program. 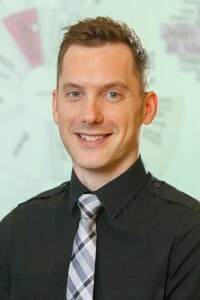 Dr. Christopher Collins is helping to organize the 2014 Workshop on Interactive Language Learning, Visualization, and Interfaces, to be held at ACL in Baltimore in June 2014. Following up on similar events such as the 2012 Workshop on Linguistic Visualization at EACL and the IEEE Workshop on Visual Text Analytics in 2013, this workshop’s aim is to promote collaborations across the fields of natural language processing (NLP), human-computer interaction (HCI), and information visualization (Vis). Three themes will define the workshop: 1. Active, Online, and Interactive Machine Learning; 2. Language-based User Interfaces; 3. Text Visualization and Analysis. The Call for Papers is online now with submissions due on March 21, 2014. Congratulations to Rafael and Brittany! Congratulations to vialab members Rafael Veras Guimarães and Brittany Kondo who have been awarded the Italian Cultural Centre of Durham scholarship for PhD studies ($5,000) and MSc studies ($3,000) respectively. Support such as these awards from the ICCD will help these exemplary students complete their studies. Brittany’s research into new ways to interact with time-varying datasets using touch screens and Rafael’s research into analyzing the language of passwords to enhance computer security will certainly have an important impact on the way we interact with information and computer systems in the future. We are all very grateful to the ICCD for their forward-thinking support of students and research at UOIT. 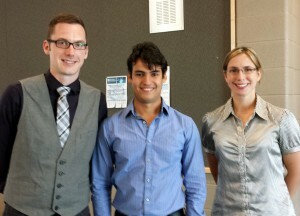 Rafael Veras Guimarães successfully defended his M.Sc. thesis “An Investigation of Semantic Patterns in Passwords”. His research investigated semantic patterns in passwords, including published work on dates in passwords, and exciting forthcoming work on the secret language of passwords. In each case, Rafael used visualization and natural language processing techniques to parse millions of leaked and cracked real passwords and organize the data. Patterns discovered in the password data, such as word-word dependencies (“goodgirl”>>”goodboy” but “badboy”>>”badgirl”) revealed vulnerabilities that semantic patterns present to passwords as a way to secure information. His research has resulted in a new method for semantics-based password cracking attacks, and will surely motivate changes to password creation mechanisms and policies in the future. As this work is in submission, and we have exciting future work plans, we have not posted his thesis or latest results, but hope to do so soon! 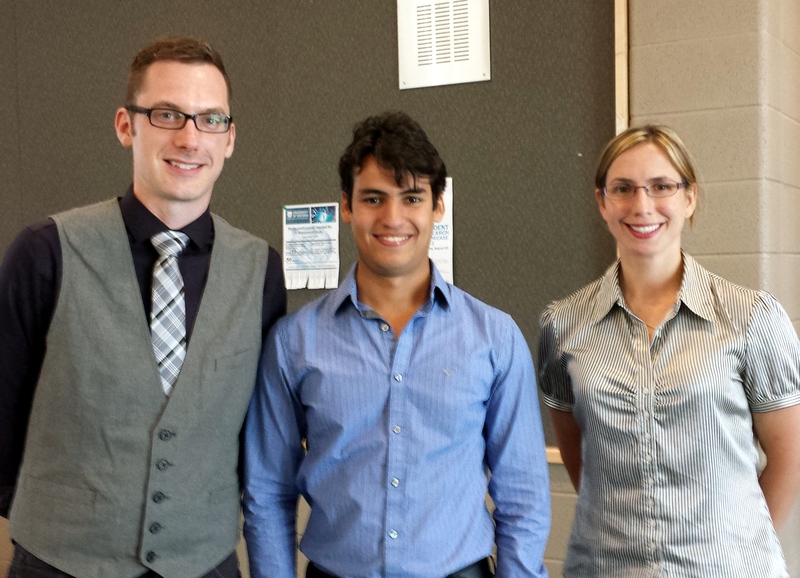 Rafael plans to stay for future studies at UOIT as a PhD candidate, and we are excited to continue to work with him. Language learning takes a lot of time, patience, and effort. Despite this, there exists many language learning models that help learners achieve their goal. One collaborative model is tandem language learning. It is based on the mutual exchange of language between partners. Using the collaborative nature of interactive tabletops, along with computer-assisted language learning software, the tandem language learning process can be enhanced. The goals of the research presented in this thesis are to understand the tasks and context of tandem language learning, and with this knowledge, design and implement a tabletop software prototype that is meant to enhance the tandem language learning model. To complete this task, I conducted a grounding study where I observed a tandem language learning environment, and interviewed its administrator and four tandem language learners. From this study, I created design guidelines for tandem language learning scenarios. Using my design guidelines, I designed and implemented a software prototype for an interactive tabletop that facilitates communication between learning partners. Contact Erik Paluka if you would like a copy of his thesis. Masahiko Itoh and colleagues at the Institute of Industrial Science, University of Tokyo have published a paper at Pacific Vis 2012 [PDF] analyzing the temporal changes in bloggers' activities and interests, with a visualization similar to my VisLink technique. They bring together linguistic analysis on snapshots of blogging and microblogging activity to dynamically create "temporal slices", which are time-specific visualizations on visualization planes. These planes are then lined up and connected using the VisLink technique to connect sequential time slices and reveal patterns of temporal change. 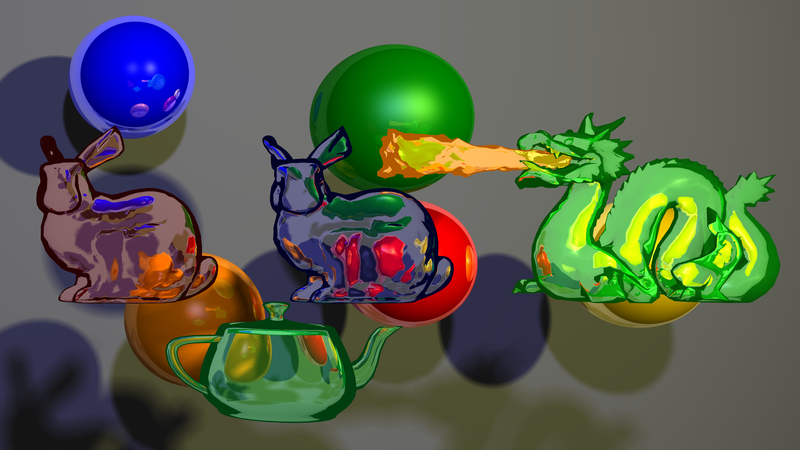 Bubble Sets is a visualization technique for dynamically creating ‘bubble’ borders around sets of visual objects, while avoiding inclusion of items not in the set. The project was previously implemented as an extension to the prefuse Java visualization toolkit. I have released a stand alone (no prefuse required) open source Bubble Sets library on github (thanks Josua Krause for creating a testing application)! The Bubble Sets technique and software were used in two best paper winners at the BioVis 2011 Symposium, HiTSEE: A Visualization Tool for Hit Selection and Analysis in High-Throughput Screening Experiments by Enrico Bertini et al., and RuleBender: Integrated Visualization for Biochemical Rule-Based Modeling by Adam M. Smith et al. Download Bubble Sets for your project!